The passing of the great actor Edward Woodward  from pneumonia today has not gone unnoticed. Woodward played many notable characters on the silver screen, he was Sgt. Howie in The Wicker Man , Commander Powell in Who Dares Wins  and more recently had supporting role as Tom Weaver in the Whopper Award-Winning Hot Fuzz . Woodward continued acting up to his illness earlier in the year completing work on A Congregation Of Ghosts currently in post production for director Mark Collicot in which he plays the lead role of an eccentric vicar who is said to have alienated his congregation and preached to cardboard cut-outs. Woodward was arguably more successful on the small screen and made appearences in both Eastenders and The Bill in the past 2 years. 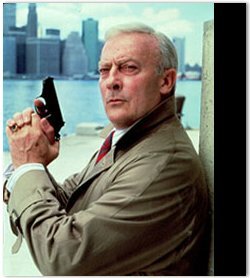 He played the title role in the 1960's spy series Callan and Harry Malone in the short lived CI5: The New Professionals in 1999. He will of course be best known for playing Robert McCall in all 87 episodes of the 1980's show The Equalizer. I have admire this wonderful actor since ever. He as you know was one of the biggest actors of all times. I just can say rest in peace dear Edward.